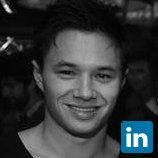 By day I'm a specialist technical recruiter in Sydney, working with startups right through to enterprise. It's my job to identify and engage the best developers in emerging tech across web and mobile. By night, I'm hustling as CEO of GetCleanr. If you've ever tried to book a cleaner you know how frustrating that process can be. GetCleanr is a new disruptive startup that takes the hassle out of hiring a cleaner. Instant booking, upfront pricing, effortless payments. Home cleaning made simple.